Today we went on the “Jewish Quarter tour” with a beautiful woman, Paulina, from Escape2Poland tours. I had to smile because that was our “girl” name if Bennett had been a girl; named after my grandma Pauline. She was an unbelievable guide giving us such a clear history and perspective of Polish and Jewish life in Poland and Krakow. 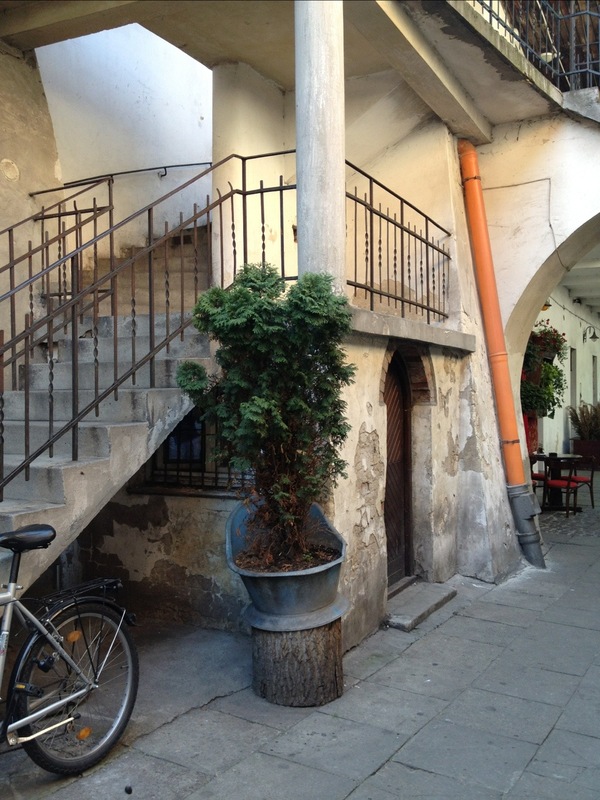 We walked the not so Jewish Jewish quarter. After the war very few Jews survived and of the few that did, many of them left Poland. 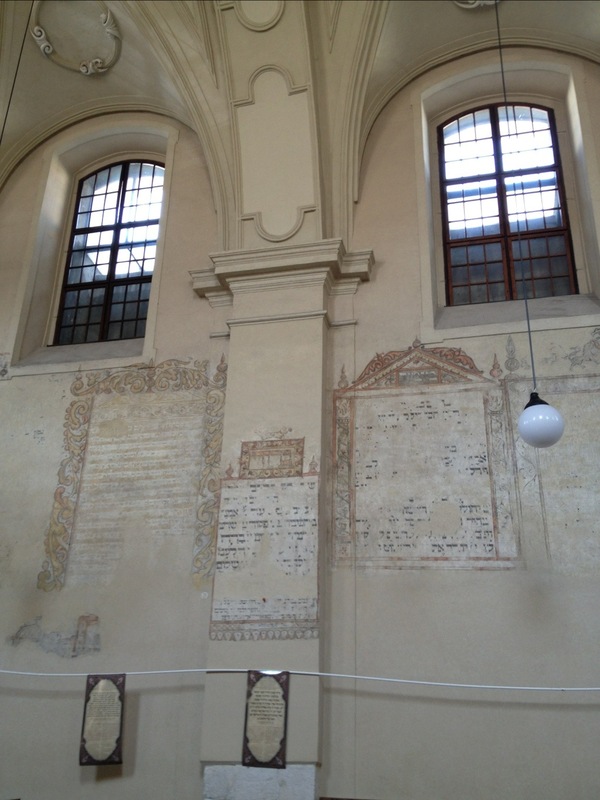 We went to the 17th century Isaac synagogue which was just purchased by the NY Chabad. I am attaching some pictures. It was so beautiful. There are so few Jews that there is no one attending or able to pay for upkeep of the synagogues. 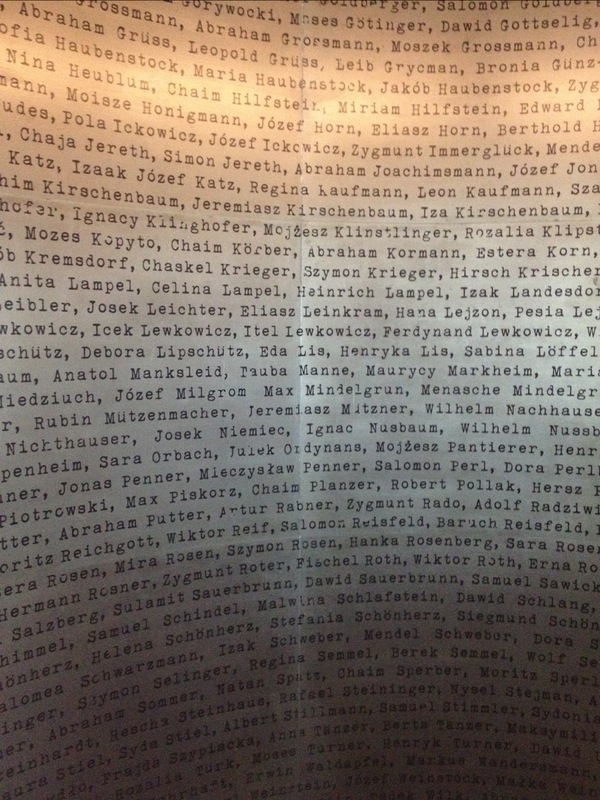 There are only 200 Jewish families in Krakow (we think we remember the statistic). Similar to what you see Schindler’s List…the Jews of the Jewish quarter who lived there for centuries got sent across the river to the industrial side of town and walls went up in the shape of a headstone 3 meters high. The ghetto walls are gone now but the space echoed of the darkness from the 40’s. When the ghetto was being liquidated they told the Jews who were living in over-crowded conditions that they were going to be relocated to the East to more comfortable surroundings. I read that people survived off only 350 calories per day. If you remember from Schindler’s list that is when Isaac Stern forgot his papers and got put on the box car. 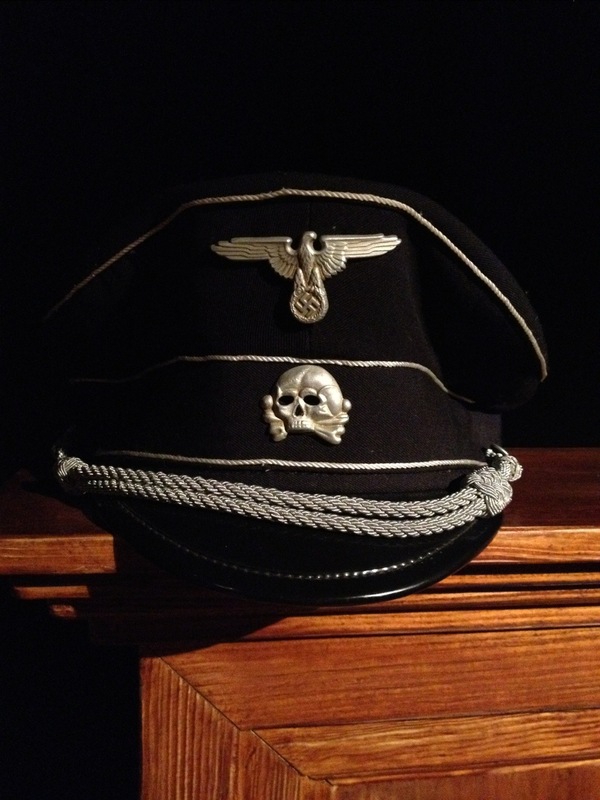 The Nazis told them to bring their belongings to the square. 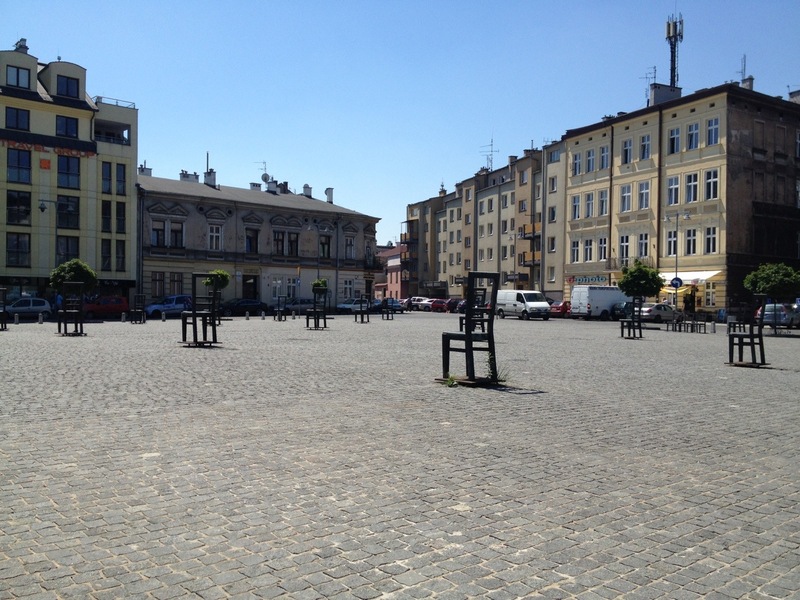 They had to carry everything so furniture including many chairs got left behind in the square. I am attaching a picture of the memorial to the liquidation of the ghetto done by an artist. Being in the square you can identify with the interpretation. 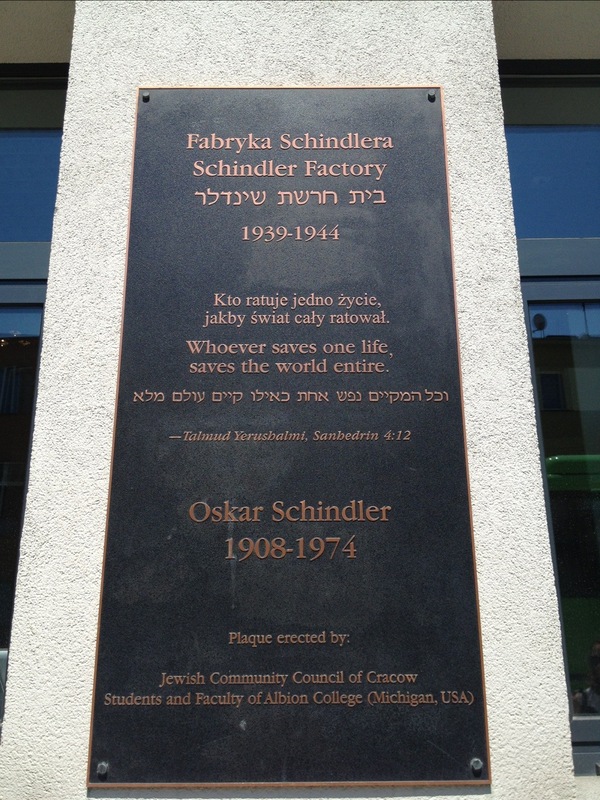 We then left the ghetto to go to the Schindler factory. The movie was actually filmed there and we were able to visit all of the notable rooms like the office, the stairway, the pots etc. 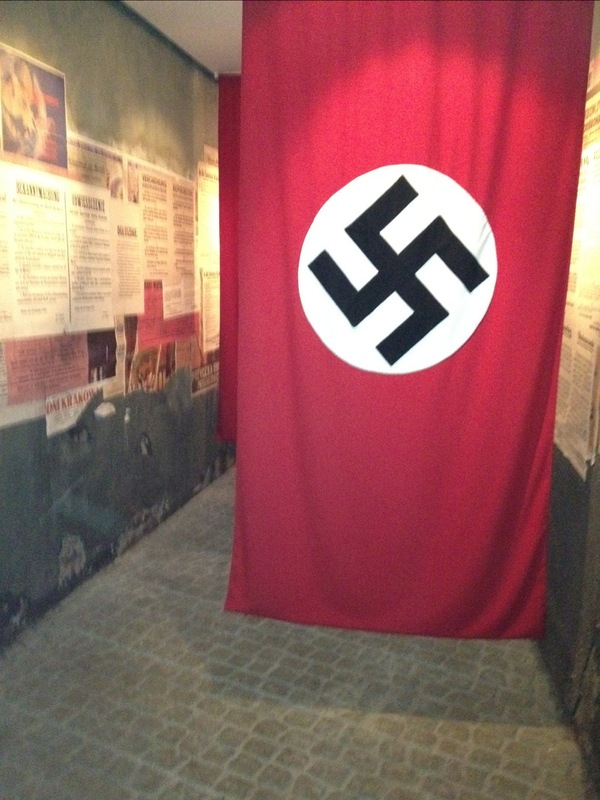 However, what was so interesting was this was the history of Krakow under Nazi occupation (1939-1945). I have never seen so many swastikas and Nazi items in one place; it was very odd. It was particularly weird seeing people taking pictures with Nazi flags. The Nazis renamed polish streets, sent the intellectual non Jewish Poles to Auschwitz, tore down historical statues, etc. It must have been absolute chaos for all who lived there. Well more later…I am on the train going back to Warsaw chatting with our new friend Tom. He is a doll and has been a great cabin mate. He told us his grandfather was a prisoner at Auschwitz for a year but was released. Fascinating. Later! 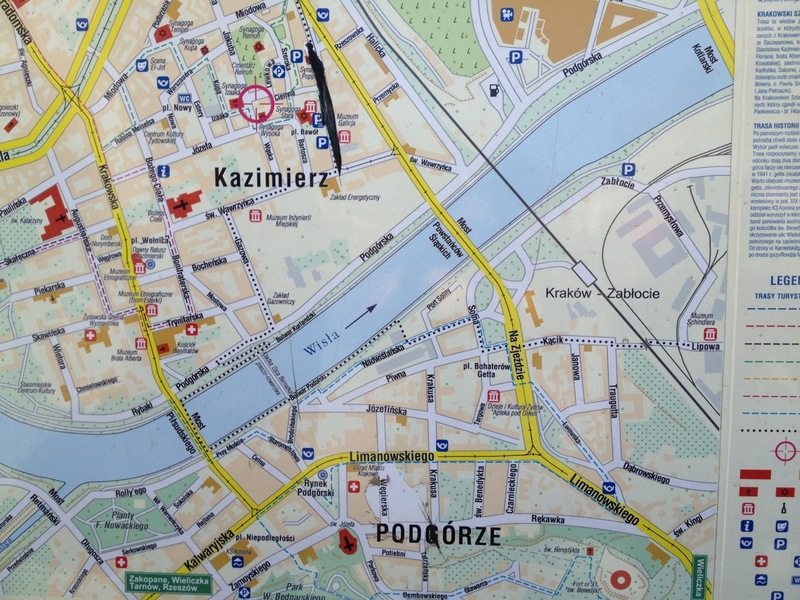 Across from the Jewish quarter of Kazimierz was the ghetto where they were all moved, the Schindler factory was outside the ghetto in the middle right side of the map. Beth you are doing an incrediable job of posting everything. I found a name that might be relations on the wall, Grossman. My grandmother was a Grossman and her brother was Abe. There was an Abraham on the wall. Love to you and your Mom. Beth, thank you for leaving this awesome post! 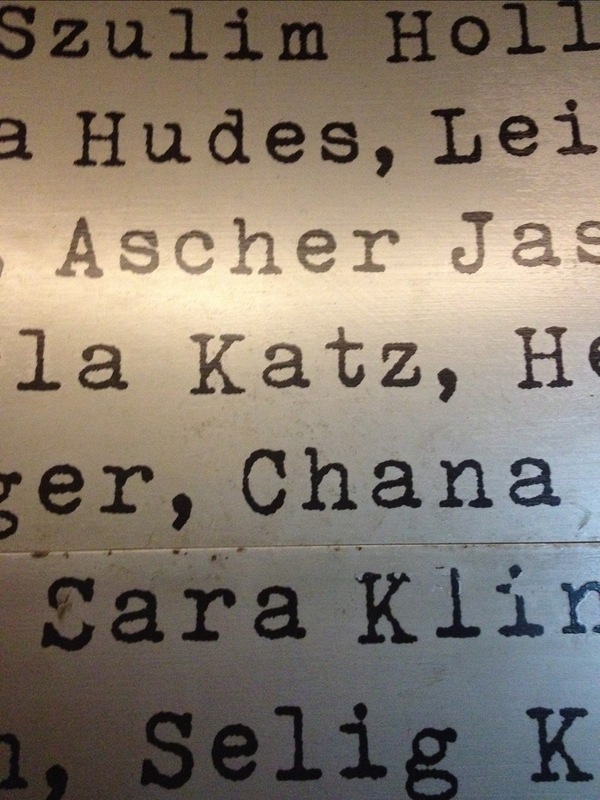 I am going to look at that picture of names to see if there is Weitz there..Blessings to you and your mom…. I am really really enjoying your blog!!! The photos are showing me things I never imagined I would get to see, and I love reading your viewpoints. Thank you so much, and I look forward to heaaring from you every day! !